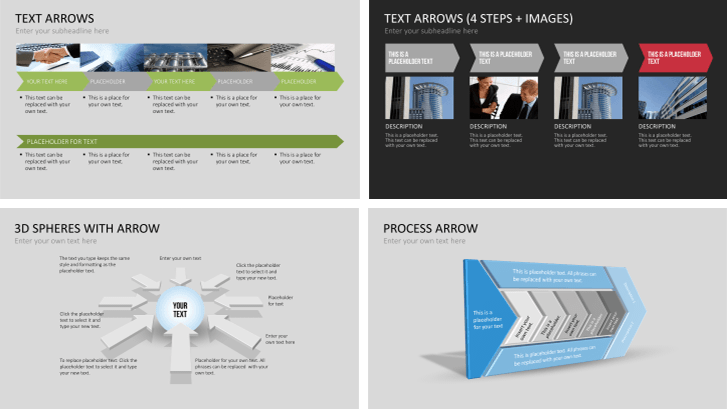 Arrow and process graphics for PowerPoint presentations. This Bundle includes two template sets (Arrow Toolbox 2D and Arrow Toolbox 3D) for an adequate representation of connections, relations and dependencies. With the help of arrow graphics, you can emphasize dependencies, relations and processes and clarify in which way content, subject matters and people are connected with each other. This extensive PowerPoint set can be used to construct presentations as well as to create graphical illustrations and provides you with a broad collection of design elements, tools and graphics for varying purposes. By using predefined templates, you explicitly explain connections and dependencies and to meet such requirements most professionally, the set provides you with numerous timeline charts, matrices and design varieties.